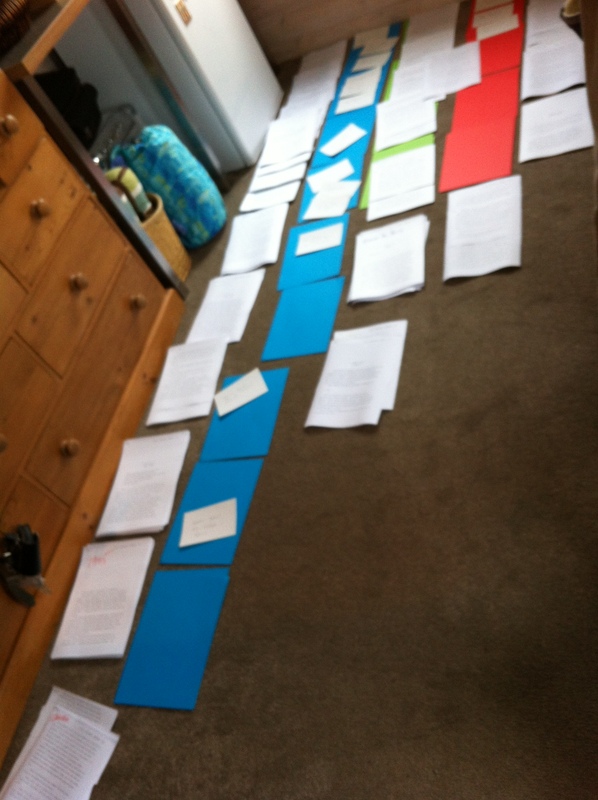 There are a lot of ways to write a book. My shelves are filled with other people’s theories and lists. There are a lot of good ideas in there, but they are other writers’ good ideas. There is only one way to write a book – your way. And each book has its own form, its own ideas, its own shape. Today found me with the scissors and the Sharpies out, chopping apart my draft into chunks that I could hold, that I could see. This is a big story. Cutting it apart reminds me that I am in control of how the chunks work together, how the strands of story push and pull. This pile of paper on the floor lets me see the shape of this second book, as well as what’s missing. There is a cork board feature in my beloved Scrivener, but even I realise that a computer programme can’t do everything. Sometimes, you have to get down on the floor on your hands and knees. Ooh, that looks incredibly satisfying. I can’t do that at the moment (growing baby + small boys + young cat = shredded paper nest) so I am stuck with the Scrivener corkboard — and a shredded paper nest, of course. Good luck with putting it all together.